The Finest Grape Tech has developed a simple method to disinfect pruning scissors at every cut. Thanks to the holster it is possible to clean the scissors at each plant, thereby avoiding the transmission of diseases within a vineyard or an orchard. The holster, containing the disinfectant liquid, appears convenient and practical, since it is designed in (such) a way that doesn’t permit the liquid to leak. This method prevents the diffusion of potential diseases during the pruning. Furthermore, it makes it possible to save time while working without having to stop to clean the scissors. Indeed, simply dipping the scissors into the holster, makes the disinfection immediate. 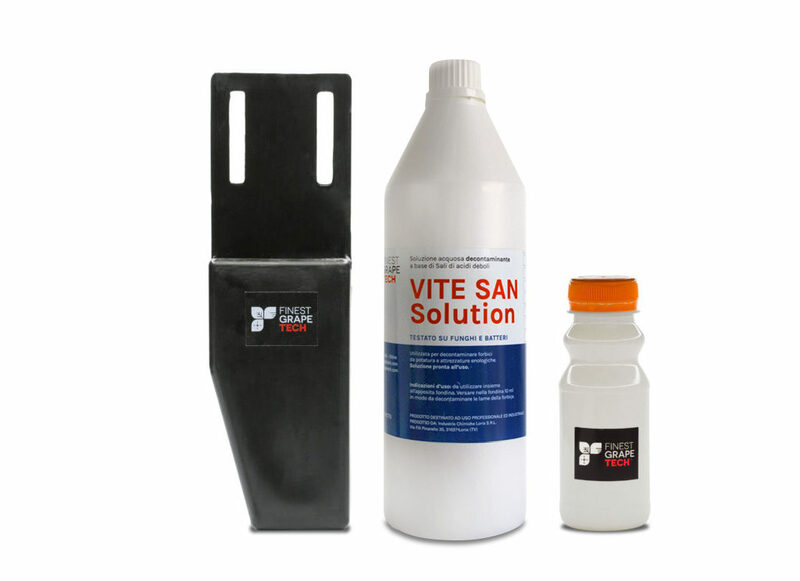 The disinfectant liquid is a solution composed of alkaline salts of acetic and lactic acid, that acts on bacteria, fungi and moulds. Additionally, it is a completely edible product, which doesn’t contain alcohol and works immediately. Thanks to these traits, this liquid is employed to disinfect winery equipment, to sterilize barriques and floors, for pruning scissors and shears, knives used for graft and to clean trimmer machine. The employment is applicable to the professional pruning of vineyards, especially the varieties that are more sensitive to “Mal dell’Esca”, such as Sauvignon and Cabernet Sauvignon. It can be adopted to prune any tree like the olive tree as well as other fruit plants, as a preventive action to avoid the spread of “cutting diseases” even in “home gardening”. Besides the preventive action, it allows the cleaning of scissors before the sharpening and thus it can be implemented directly while working in the vineyard, either halfway or at the end of the vineyard. For further types of orders don’t hesitate to contact us by email. For Italy shipping: 3 working days. For Worldwide shipping contact us via email.